The base of this canapé is a disc of tasty Yorkshire picante Chorizo made by Paganum the award-winning online butcher based in Kirkby Malham. It is flavoured with black pepper, ginger, garlic and smoked Spanish paprika which work really well with shellfish such as scallops, or prawns, and slow-roasted tomato. Preheat oven to 180C/gas mark 4. Cut cherry tomatoes in half, season and sprinkle with chopped rosemary or thyme. Dribble with a little olive oil and roast for 45 min. Place chorizo on a baking tray and roast in the oven for 5 min. Coat scallops with a little oil and season. Preheat a frying pan and cook each scallop for one minute on each side. 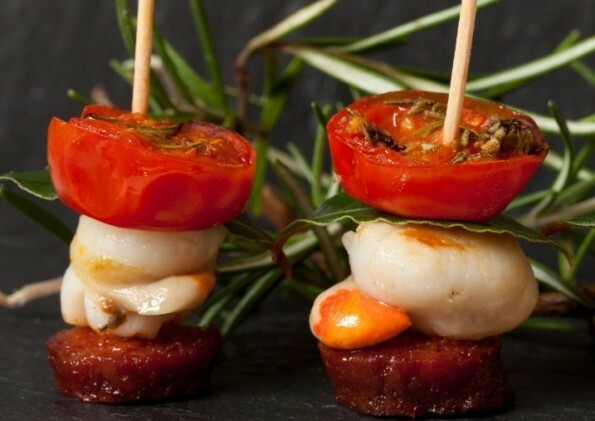 Thread chorizo scallop and roasted tomato on a cocktail stick and serve with some torn rustic bread. Yorkshire Post, Joan Ransley is membership secretary and workshop co-ordinator for the Guild of Food Writers. © 2019 Yorkshire Chorizo. All Rights Reserved.